Green Zone, director Paul Greengrass’ new film, takes us back to those exciting days in 2003 when the Iraq war was just beginning and the search was on for weapons of mass destruction. (Yes, that was sarcasm.) Of course, now we know that there never were any WMDs, but for Roy Miller (Matt Damon), a chief warrant officer in the U.S. Army, this is a new discovery — and he’s pissed. The film focuses on Miller’s search for an intelligence source known as Magellan, who was the person who sent the Army on its wild goose chase. 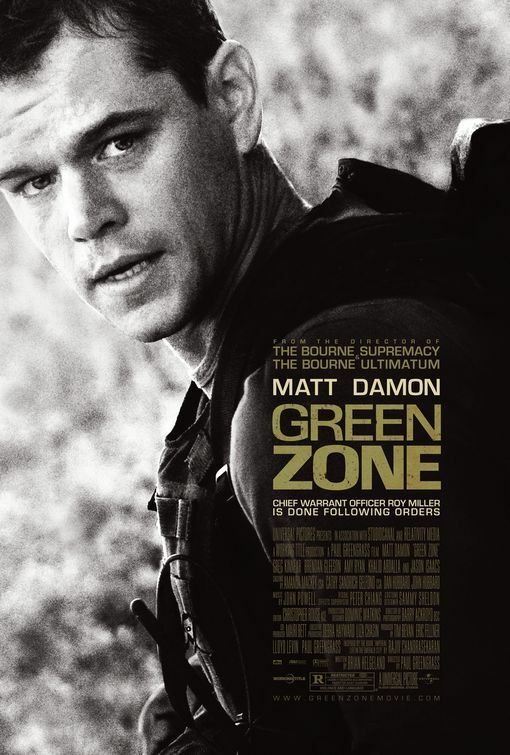 Reuniting Greengrass and Damon for the first time since their Bourne films (and Damon with Greg Kinnear, costars in the Farrelly brothers film Stuck on You), Green Zone is certainly an exciting two hours. Greengrass’ beloved shaky-cam method of filming reflects the chaos of the situation in Iraq, and he keeps the action moving from start to finish. If only the film was less underwritten. Oscar nominee (and erstwhile The Office guest star) Amy Ryan, for example, isn’t given enough to do as a Wall Street Journal reporter. And that shaky-cam stuff does get a bit nauseating. So while Green Zone is a compelling Iraq war action film, I’m only going to give it a B.